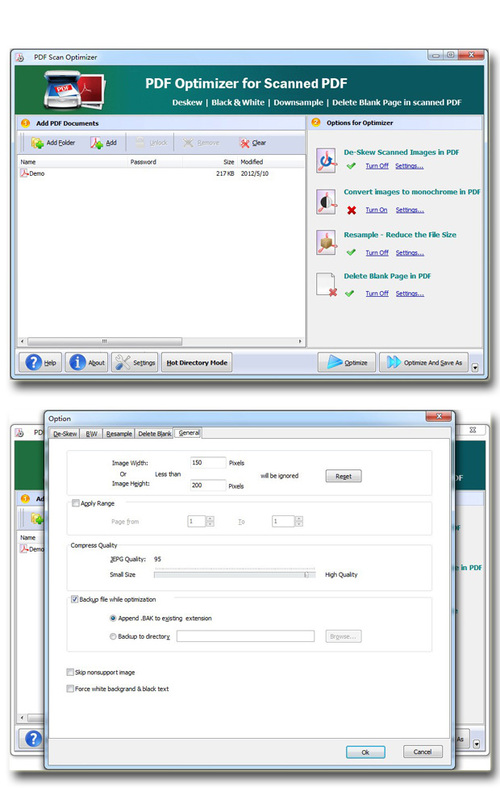 Easy PDF Scan Optimizer 1.0 Free Download - Excellent optimizer to rectify scanned image within PDF! Last Updated: 8/16/2012 | File Size: 3538 KB | Price: $39 | Downloads: 111 | Developer: Easy PDF Tools Ltd. Sometimes we might have to scan our papers and images to PDF document, however the images within PDF always are skew or in incorrect color. With Easy PDF Scan Optimizer, you don't need to worry about those problem any more, it provides so much practical options to perfect your PDF document, for example, de-skew image with proper angle, convert image to monochrome. Statement: First, please download the orginal installation package by clicking the download link. Of course you may also download it from the publisher's website. Using Easy PDF Scan Optimizer crack, key, patch, serial number, registration code, keygen is illegal. The download file hosted at publisher website. We do not provide any download link points to Rapidshare, Hotfile, Depositfiles, Mediafire, Filefactory, etc. or obtained from file sharing programs such as Limewire, Kazaa, Imesh, Ares, BearShare, BitTorrent, WinMX etc. Software piracy is theft. If you like Easy PDF Scan Optimizer please buy it.